Ash content, high furnace temperature, increased sootblower pressure and longer time between cleans – all these things result in the likelihood of greater erosion to boiler tubes. 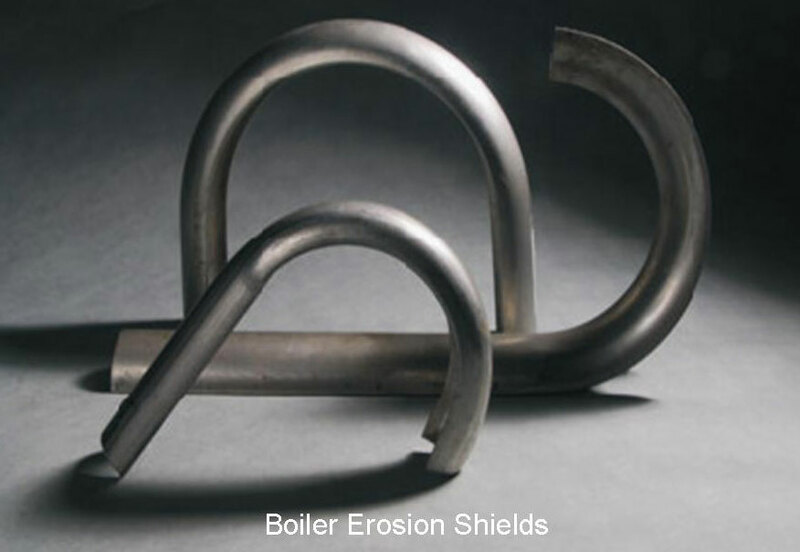 In such cases, the most effective course of action is to shield the erosion prone tubes with boiler erosion shields. This alternative is far cheaper than actual replacement of damaged sections of boiler tube, to say nothing of the associated downtime and loss of generation capacity and revenue that occurs with a tube leak. Uneek Bending Co. Pty Ltd offer various types of boiler erosion shields for boiler tube protection. Typical shields cover a 180Â° segment of the tube and are 1000mm long. We also manufacture clips that may be welded onto the shields to hold the shields in place. The shields can be manufactured to suit any tube size. The most common tube sizes are 38.1, 44.5, 50.8, 57.15,60.3 and 63.5mm diameters. The erosion shields can be made out of mild steel, chrome moly steel, stainless steel and exotic alloys such as Inconnel. The most popular materials and sizes are 3mm stainless steel grade 304 and 2mm stainless steel grade UNS S30815 (Sandvik grade 253MA). Uneek Bending uses certified material to A387 P11,P22 chrome moly and Australian Standard A240TP304, 316 and 309 stainless steel. Our shields can also be coated with a hard wearing chromium carbide coating for addtional wear resistance.